Dress for every occasion the right way by browsing the huge collection of casual pants, tailor made for the woman-on-the-go. Contemporary designs and crafted with care, these pants are sure to help you stand out in all your day time or casual meet-ups. Teamed with different tops and shirts, these casual pants are sure to make you rock every look be it office chic or weekend glam. Shop a wide variety of casual pants for women right here on the Sun & Sand Sports Online Store with brands you can trust at prices you can’t beat! Fitting any lifestyle and budget, the amazing collection of casual pants for women offers trendy colours and stunning prints, guaranteed to accentuate your fashion-forward style. From black pants perfect for a night on the town, to casual khaki pants to kick it back in style, you will be spoilt for choice to grab your favourite pair! The stretchy fabrics come designed with new-age techology to help you get the most out of your outdoors jaunt while keeping you infinitely comfortable. The smooth blend of fabrics helps you stay cool in the Dubai climate by being ultra-lightweight and non-restrictive and making sure that you not only feel good but look even better! Different sizes to different cuts, our nifty size guide is here to help you find your custom fit by clearly stating all the measurements to the dot - making it easier for you to get your perfect match! 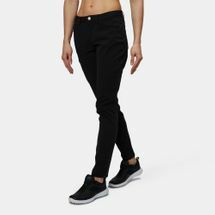 The Sun & Sand Sports online store has made shopping easy from the get-go by giving you a huge collection of casual pants for women to help you choose the right pair (or a few more!) that takes your fancy. With an easy checkout and payment procedure, you can expect your goods to reach you promptly right to your doorstep anywhere in U.A.E, from Dubai to Abu Dhabi.